Resistance is growing and necessary. I recently (finally) quit a job I had as an academic tutor at a magnet school in Chicago. For those who are unfamiliar with the term, magnet schools are public schools with ‘higher standards’ and ‘better reputations.’ They often receive different or more funding than traditional public schools, and one usually has to apply to get in. They were invented several decades ago in the wake of white flight, as a means of keeping cities’ wealthy inhabitants from completely fleeing to the suburbs and thus decimating urban economies. The school at which I worked had been converted into a magnet in the last five years, resulting in a sharp race, class and geographical contrast between the older students with whom I worked, and the younger ones, who tended to be whiter and wealthier. Like most magnet schools, this one had a good reputation, and parents often worked hard to get their kids in, traveling at great expense from all over the city to get their kids to class. What I came to learn as a tutor is that the school’s good standing is based almost entirely on its higher-than-average Illinois Standard Achievement Test scores, the public school state test. The school’s environment and philosophy were pervaded not only by the desire for high scores, but the value of state-determined skills, and the ability of each individual student to meet them. Mandatory after school tutoring for “low” students, in-class skill drilling and other depressing measures were an integral part of the school culture, and while these attempts to raise scores can be witnessed at any public school in the months before a big test, the gusto with which this school pursued them, the pride it took and the genuine belief that it was positive for students was shocking to me. Its efforts were largely supported by parents–especially those of more privilege–and its regularly high scores secure its place as a “good school” within the failing system. Racism and Classism – It’s been long documented by critics of standardized testing that the thing their scores indicate with the most reliability are the race and class of the test takers. Whereas schooling itself makes certain assumptions about the resources, values, identities and experiences that belong to its students, standardized testing works to further entrench these assumptions rather than resist them. By deciding which students, schools and communities are failures, standardized testing reinforces the racial and economic segregation of school systems and individual school communities. “Low” and “high” become the inevitable descriptors, the two categories into which all students are sorted, the euphemisms for their entire identities as learners. Whom each category is comprised of tends not to be surprising, and how their scores allow them to be treated by teachers, staff and community members is not hard to guess. More and more evidence suggests that schools that are under the most pressure and state surveillance increasingly suspend and expel low performing students at higher rates, sometimes for the sole reason of raising the school’s scoring average. The stigma, lack of opportunities and resentment these students are made to bear only add to the pressure and prejudice they must face in their larger worlds. Behavior – Any experienced educator can tell you that when students of any age are excited about what they are learning, engaged in determining what their own learning looks like, respected and esteemed by the learning community, and responsible for maintaining it as equal partners, the need for “discipline” all but goes away. Behavioral issues, and the tactics which teachers spend hours a week implementing to combat them, are mostly if not entirely the result of forcing students to learn in prescribed ways what is uninteresting and disempowering. The disjointed, shallow, and repetitive nature of standardized tests and their preparation eliminate student voices even further from the learning process, and gives educators even less opportunity to listen to and respond to the needs of their classrooms. The relevant, empowered and collaborative curricula our communities are starving for is made all but impossible to realize, and students naturally resist the force with which the state demands they conform to its own economic desires. The result is more disruptions, more frustration and alienation, more violence, more punishment, and more students suspended, demoralized, and fed into the prison system–an alternative which works just as well for the state. Student Autonomy and Ability to Learn – It should go without saying that students are the most adversely affected by standardized testing. It denies them their creativity, ability to ask questions, to explore their own interests and pursue the knowledge which they deem relevant–all the things that should be at the foundation of any type of learning. That state testing removes these most fundamental characteristics makes it all the more difficult to see the bigger struggle: That public education itself, even when it is properly funded and supported, relies on the meek obedience of young people. It expects that adults will control their learning and make most of the decisions about what student participation should look like. The fight that is still in the midst of being fought, even when it’s being obscured, is the fight for an education envisioned, designed and controlled by its own students. Standardized testing also draws attention to this, for nothing educators, families and professionals are saying publicly now is any different from what young people in schools have been saying for years. If student voices counted for something, and if young people had a real say in the structuring of their own learning, standardized testing would have been nixed decades ago. Bullying – Blogger Amanda Levitt wrote poignantly on her site this last year that the superficial attention we tend to give bullying–telling bullies to play nice, and reminding the bullied it gets better–fails to understand bullying as a symptom of a violent and prejudiced social order, one for which we all need to be held accountable. Bullying is not individual kids being mean, but the aggression, sexism, harassment, queerphobia, racism, classism, ableism and fat phobia young people have learned in other places coming into practice. This astute observation needs to be tied to the reality of standardized testing. 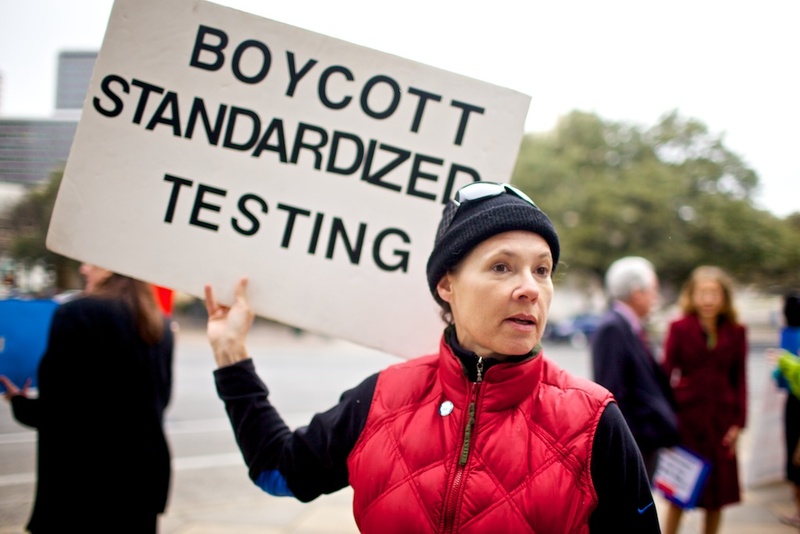 Not only does state testing reestablish the hierarchy and judgement of the larger order–the state dominating teachers, teachers dominating students, high and low students dominating one another–but it discourages the critical conversations necessary to realize and challenge those orders. Standardized testing not only teaches bullying, but constricts our ability to do what we ought to do to address it at its roots. And try facilitating timely, supportive, ongoing reflections on big social issues and our ability to combat them, when the future of your job–and your school–depends on a test there’s no way to prepare for. Community Health – Given all the other dynamics and values which testing evokes, it should be logical that is in no way healthy for the members of learning communities. On all levels, it eliminates people’s ability to advocate for themselves, express their needs, and to reshape those things which are not meeting them. It demands, in fact, that communities place the wants of the state before their own most basic desires, and ruthlessly punishes those who do not comply. It expects exhaustion, rewards silence, and fosters undeniable resentment, racism, classicism and hatred. It teaches young people to hate school, hate their teachers, hate “learning” as defined by what the state forces them to digest. It teaches teachers to hate their students for resisting what they are required to teach them, and to hate one another either for complying themselves, or else pushing back and making life difficult for the school. It breeds suspicion, anxiety and stress across the community, pitting parents against educators, neighborhoods against schools. It banishes, it cuts off resources, it sends people to jail. It undermines and destroys learning communities, plain and simple, and has no place in an education aiming for relationships of support and compassion. The dynamics I have described here were each a part of daily life in the school at which I recently stopped working. They represent a model which is being ramped up by the state and private sectors, despite protest, overwhelming public opposition, and the obvious consequences for our communities. The struggle for public education is approaching a tipping point. Further resistance, action and solidarity are needed to demand an education controlled by the people, not by business and not by the state.